If you don’t know what Harajuku is, it is an area in Tokyo that is only a few blocks long where many exciting and interesting fashion styles and subcultures were born. It is a place of creativity, and a special zone where the people that partake in these different fashion subcultures meet and gather. You may have seen images across the internet of girls wearing colorful tutus and dozens of rainbow hairclips. That is what Harajuku has become publically known for, but that is only one of the many different styles that exists in Harajuku. So much of the literature that exists on Harajuku fashion is extremely dated. The styles it had become popular for are now gone due to changes in style/aesthetics over the years as well as tourists/gentrification pushing a lot of people out of the area. In addition, popular street snap magazines from Harajuku such as “Fruits” and “Kera” have closed down as a result of the internet and Instagram becoming more popular ways to share information. As a result, many people are worried about Harajuku id “dead” because these 90s styles that were so popularized no longer exist. This is not true, in fact, Harajuku fashion has become so popular worldwide that there are communities for people interested in the fashion spreading everywhere, including in my home city of Los Angeles that I am a part of. Many people have an idea of Harajuku as being a place that is crazy, random or superficial, but there is an abundance of rich inspiration, lifestyles and communities associated within each style. My capstone project aims to deepen the understanding and appreciation for these styles and creativity, as well as bring an update to the conversation about what is happening in Harajuku today. I want to show that no, it is not dead, but very much so alive and thriving. 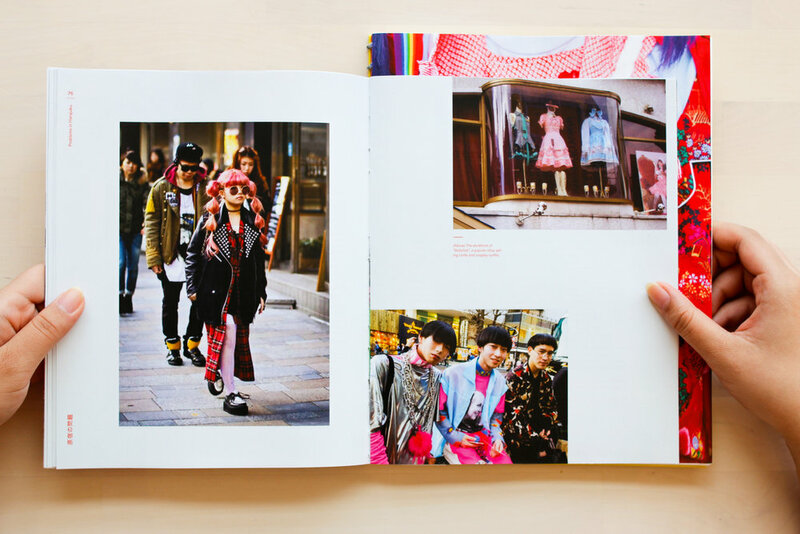 The binding of my book speaks to how Harajuku is made up of a multitude of different styles and subcultures that all come together in this one location. My book operates similarly, as it is made up of three different sections that each showcase different topics, grids, image systems, typefaces, and concepts coming together to make one book. My challenge was taking the way Harajuku has been documented (primarily by street snap photography) and making it look visually compelling and interesting for my viewers. Because information on Harajuku is currently difficult to find, I had to reach out to Megan Russell, a PhD student from the University of Wales who recently lectured on kawaii cultures in Harajuku and what is happening to them now at the “Fruits 10th Anniversary” celebration late last year. In addition, for my history of Harajuku section I used an essay written in the book “Japan Fashion Now” by Valerie Steele. For the last section cataloging the different styles, I had to do my own research and writing, and connect with my own friends involved in Harajuku communities and go deep into Japanese sites and translate to find out what is happening there today. The first section of my book focuses on the history of Harajuku. I used colorful collages, playing with texture, fabrics, patterns and neon to show the excitement and spirit of creativity that exists in this place. The second section discusses the current state of Harajuku as a location and talks about gentrification/tourism in the area and why this is affecting the fashion communities there. I wanted to focus my design on the special zone of Harajuku in this section, based on geography and the street as this part deals with the problems going on in the location itself. I opted to use candid photos of the location and people interacting in the space, rather than street snaps as the other sections have. In addition, the section begins with a map to help the viewer locate the zone. The third section ends the book on a positive note. I used street snap photos to catalogue a list of the current subcultures that exist and occupy the space in 2018. 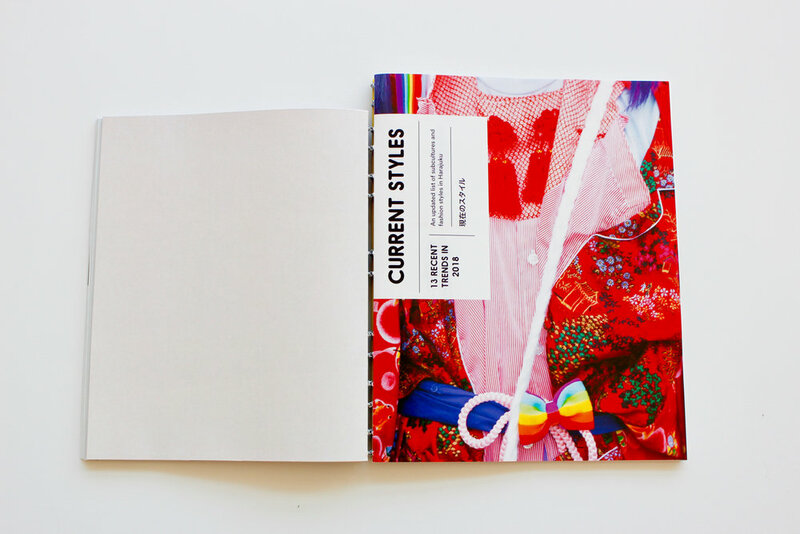 This acts as a guide to show that Harajuku is not dead, and provides viewers with a comprehensive overview of each style so they can become familiar with them and if interested, pursue them. To sum it up, I want my book to show that Harajuku is not a specific style or look, but rather a special zone of creativity. Many iconic fashion subcultures have been born there, but none of those styles define it and it is still thriving and very much alive.